At my last job, there were quite a few dog lovers on staff, and occasionally someone would bring their dog into the office. One day, a coworker popped in on her day off to show off her new puppy and most of the staff, especially the women, were going gaga over it. During this instance, and similar others, it was observed that I didn't rush over to stroke the cuddly pooch's mane. That led to a coworker saying, "Jarvis doesn't like dogs." To which I replied, "I like dogs. I just don't like other people's dogs." The reason I remember vividly what I said is because my response became a running joke whenever the subject of pets would come up in the office. So now that you know my stance, you should understand why I was bothered by a news article I read a few minutes ago that said "N.C. may allow dining with pets." 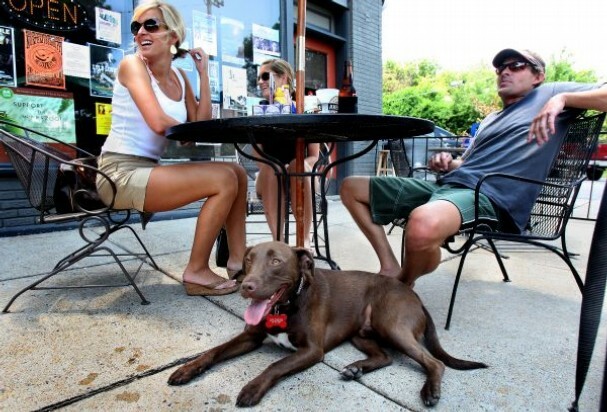 State food service regulations currently ban pets from being inside restaurants or on outside patios where food is being served. But on Thursday, the N.C. Rules Review Commission will consider a proposal that would permit cats and dogs in outside dining areas. If it's approved, the changes would likely take effect August 1. I know the dog and cat lovers are going to hate me for this, but I don't want your pet around me when I'm trying to enjoy my meal. You treat Fido like he's human, but to me he's a dog. Your dog. I'm a fan of the Humane Society, PETA, and I believe that pets should be treated humanely--but not humanly. We just got rid of smoking from North Carolina's restaurants and bars. Please don't tell me that I will now have to inhale secondhand fur. I agree with you. How do we make sure this doesn't happen? EWWW! I'm with you on this! If this goes through, no more outside dining for me! There's nothing that quite ruins the appetite like a drooling dog.I think smoking should be banned in dining areas period (including the outside patio) and so should pets. Inside or outside, both are unsanitary practices around food. Since all the smokers have been pushed outside, it's already to the point where it's almost inevitable that you'll be dining in a cloud of smoke if you choose the patio, so this will only be another unfair added annoyance for those of us who just want to enjoy and outdoor meal in peace. I say keep fido (and your cigs) in your own kitchen!